How do I book a ticket to see Father Christmas? Bookings will be open on Mon 3rd September! Click here to book online using our secure booking system. How often are the time slots for Santa’s grotto? Tickets are available divided into 5-minute time slots. This time slot is for a single family group. At least one parent or guardian must be present with each group. What does the visit to Santa visit consist of? The visit starts with a magical meeting with the elves at the grotto entrance. The elves will know the children’s names and ages. 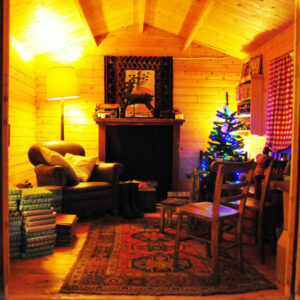 Then the family group visit Santa’s Gingerbread House and garden and play whilst waiting for Santa to be ready. Then Santa’s special elf comes and collects your group and takes you on a walk through Santa’s frozen winter wonderland with its icy sounds to the door of Santa’s Grotto itself. The group enters and meets Santa for the highlight of the experience. Santa will know the children’s names and ages and what they want for Christmas. He will talk to the children and they will each receive a present before they leave. Gifts are designed for children ranging between the ages of 0 and 9 years. The visit ends with a return walk through the frozen wonderland and back to the Gingerbread Garden before returning to the Blackthorpe Barn for the rest of the visit, perhaps for some refreshments or a visit to the shop or to browse for a tree or visit to the Crafts. Please ensure that you are confident in being able to fulfil your booking before completing the purchase of tickets. How long does a visit with Santa last? The visit to Santa last about 3-5 minutes but there is also the visit to the Gingerbread House too so the whole experience lasts about 10 minutes. Everyone’s welcome at Santa’s grotto but it’s ideal for children under 9 years of age. All visits to Santa’s Grotto are booked online. Booking online is quick, easy, convenient and safe. It’s a stress-free way to select a convenient date and time, with a guaranteed time slot, so you are not left disappointed by long queues and over demand at peak times. If I choose NOT to book a ticket in advance how can I obtain a ticket? Most days are completely sold out in advance so we would not recommend just showing up. This is likely to result in a lot of disappointment which is what we all wish to avoid! Can I book in advance by telephone? No. Advanced ticket purchases can only be made online or in person at the Grotto entrance whilst the grotto is operational. Can I pre-book tickets online on the day of my visit? No. Pre-booked tickets can only be booked up to Friday evening of the weekend of the visit. If you chose not to book in advance, it may be possible to purchase a ticket in-store on the day. This option is, however, restricted to the number of non-pre-book tickets available and the availability of non-pre-booked visits cannot be guaranteed. Tickets are £7 per child 0-9yrs old. Each of these children will receive a gift either wrapped or in a very special Santa bag. Every child entering Santa’s Grotto must have a valid ticket and be accompanied by a responsible adult. We allow a maximum of 4 adults or children over the age of 10 (£2) per visit into the grotto and they do not receive a gift. Is there a charge for babies in arms 0-12months? A standard booking must be made for each child. Every child entering the grotto must have a valid ticket. There will be a special gift for all ages. Once booked can I change the time or day of the visit? Once booked cancellations can be made up to three days before the event. After this date cancellations are no longer possible. It may be possible to transfer your booking to an alternative time slot this is subject to availability. To avoid any later disappointment, we would ask that before completing the purchase of tickets you are confident in being able to fulfil your booking. Can I amend the Christmas list? Please email the changes and we will amend the children’s Christmas wish list. What kind of waiting time is expected? With online booking, we hope to minimise your wait to see Santa. At peak times (weekends in December) this may vary due to the high volume of people visiting the grotto. Where is Santa’s grotto located? Santa’s grotto is located in the courtyard, near the Christmas tree sales area. When should I look to arrive at Santa’s grotto? Please make sure you allow plenty of time to arrive before your scheduled booking slot. We recommended that you arrive at the grotto entrance no later than 5 minutes before your pre-booked time slot. Yes. Parking is FREE, although spaces are limited. Please note that during peak times our car park can be extremely busy. We ask you to consider this when planning your time of visit and allow plenty of time before you set off. Is there somewhere to put pushchairs? Sorry, we regret that no pushchairs will be allowed into Santa’s grotto. We advise that if a pushchair is necessary, that it be left in your vehicle until your visit with Santa is over. Can we bring food or drink into the Grotto? No. We would ask that you refrain from eating and drinking whilst in the grotto. Can we take photographs or recordings in the grotto? You may take photographs during your visit through Santa’s grotto. The last bookable slot to see Santa is 3.55pm on Saturday 22nd December. Yes. It is near the grotto and we have two baby changing areas and an accessible toilet. Yes, there is disability access with flat surfaces throughout. We are very happy to welcome children with special needs. Please let us know the detail on this when you book so that we can be as helpful and welcoming as possible.